I've got one boy who wants to be a video game creator and three little siblings who love to watch him do his thing. When I told my kiddos I had some new, fun games for them to check out I might as well have told them we were going to Disney World. I'm glad they are easy to impress, amen? Amen. Poki is filled with computer games of all sorts for kids of all ages. The games are separated by categories on a drop down menu, and you can also search by what's popular, new, etc. Best of all, it's free! You can also find your child's favorite characters, tv shows, movies -- there's bound to be a game for it! We save any screen time for weekends and only have one computer. I sit with my kids while they are doing this. There are ads that play before the games, and so far all ads have been appropriate for children. There are definitely games above my kids' age level, but they know what they can choose from. My daughter was especially thrilled at the dress up games. It tickled her to know that there are such thing as girly games. Homegirl has got three brothers, she had no clue this sort of this existed. Bless her heart. 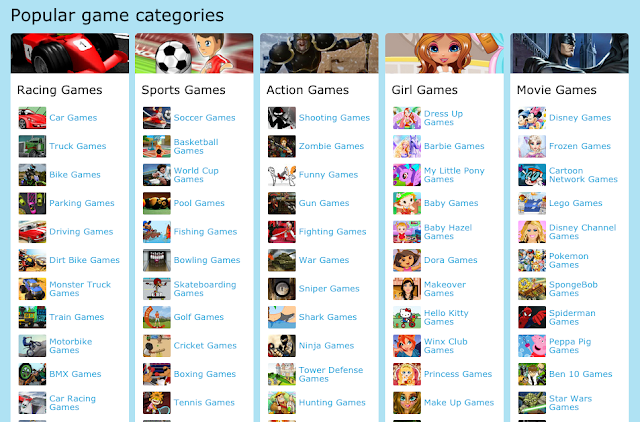 If you're looking for a new, free site with games for your kiddos, look no further! Poki offers endless choices in games for all ages!